The cycle lane is somewhat indistinct at this intersection onn Armagh Street travelling east, and it is often full of cars, meaning cyclists have to ride on the tram lines, which causes some difficulty. CCC please paint the lines on the road, or install some barriers to keep cars off the bike lane - this is hazardous when a tram is nearby, and dangerous for cyclists. 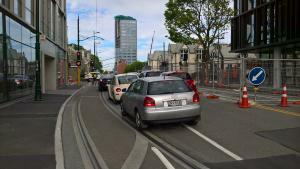 Note in the photo, there is no turning lane so cars travelling straight through are using the cycle lane, leaving right turning vehicles in the car lane.